Jupiter, FL. - Tonight had the feel of Opening Night, a fantastic crowd filled Roger Dean Stadium to watch their Jupiter Hammerheads open the season against Southern Division rival St. Lucie and Michael Mader got the ball for the first time this season. The 501st Everglades Squad along with the Mandalorian Mercs Costume Club arrived dawned in Star Wars Saga gear, Darth Vader, Storm Troopers and the whole characters group were here for a wonderful night of baseball. Also, JTAA arrived with upwards of 30 Little League baseball teams inside the park to enjoy an evening of baseball. The Hammerheads and Mets certainly provided a show. Through the first two innings it was nip and tuck as the Hammerheads trailed 2-1 going into the top of the third. St. Lucie (2-1) plated two more runs to grab a 4-to-1 lead, three consecutive singles lead off the inning, Michael Katz, John Mora and Tomas Nido. Katz scored on the line drive to center from Nido and Mora would later score on a single to center from Phillip Evans. 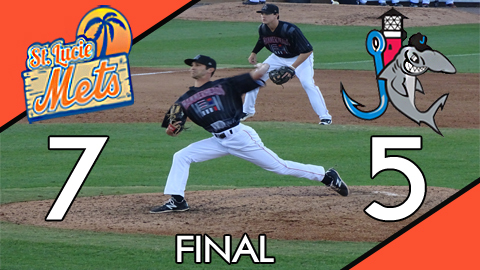 In the bottom half of the third the Hammerheads (1-2) answered with four runs on three hits. Jupiter loaded the bases and a base-on-balls to K.J. Woods brought in the first run of the inning, Brad Haynal cleared the bases with a double to plate three more runs putting the Fish on top 5-4 through three. Manager Randy Ready, "We did a pretty good job staying tough, defensively it got away from us but it is early and we got a good look at our guys. Mader did not have his best stuff tonight, but he battled well and kept us in the game. James Buckelew looked good, but overall we just need a few more innings and more time, it is very early in the season." In the top of the 8th inning Esmerling De La Rosa was brought on in relief for Jose Adames and walked Patrick Biondi. Biondi moved to second base on a sacrifice bunt and later scored on a Luis Guillorme single to left field. De La Rosa sent an errant pick-off throw down the right field line in attempt to catch Guillorme napping at first and he takes advantage of the miss-cue by advancing all the way to third. Guillorme scores on a line drive single to center field by Michael Katz putting the Mets up 7-to-5 and that is where it would finish. Brad Haynal went 2-for-4, was the only multi-hit batter in the lineup, drove in three runs and moves his early season batting average to .556 with four RBI's on the young season. Brian Anderson slammed a solo shot in the first inning, his only hit of the day, with one RBI, two base-on-balls and two runs scored. Brian Schales finished 1-for-4 with one run scored, John Norwood went 1-for-4 as well and the same hitting line for Yuniel Ramirez in the loss. A game time of two hours and fifty two minutes in front of 2,352 fans as the Jupiter Hammerheads and St. Lucie Mets prepare for game four of the season tomorrow, first pitch set for 1:00 PM as Ricky Knapp is expected to get the start on the mound for St. Lucie and Jorgan Cavanerio is the probable starter for your Jupiter Hammerheads. Be sure to visit www.jupiterhammerheads.com for tickets and watch your Hammerheads take the field here at Roger Dean Stadium!